Live Industrial presents StraPack pallet strapping machines in two models. StraPack D-53PLT2 pallet strapping machines offer versatile tension capability, simple operation, 4-way pallet entry and lower sealing point while the D-53HE2 model offers easy height adjustment and simple operation. StraPack D-53PLT2 pallet strapping machines are offered with manual tension or automatic tension options, selectable using a simple switch. 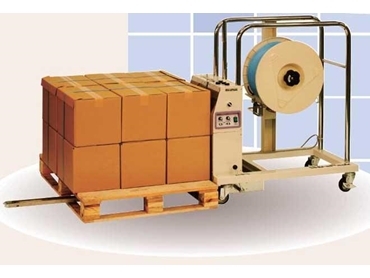 In manual tension mode, the strap tension can be controlled manually via the operation bar, allowing edge protection to be secured to the pallet prior to strap completion. In auto tension mode, strap tension is applied automatically at a preselected level. Both models are also available in battery operated versions.